TOKAJI.com .::. 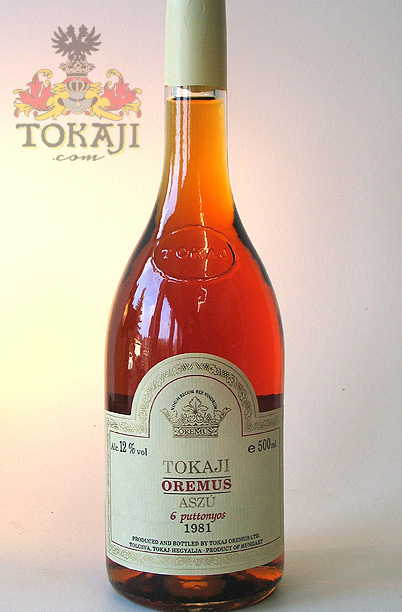 Buy Premium Tokaji Aszú : 1981 Oremus Tokaji Aszú 6 put. You are here: Home BUY TOKAJI Buy Premium Tokaji Aszú 1981 Oremus Tokaji Aszú 6 put. 1981 Oremus Tokaji Aszú 6 put. Deep flavors of apricot and peach with great honey character. This wine was still in casks, when Oremus bought the Tolcsva estate and its cellars, and then bottled by the new winery in 1994. "Bright orange-gold. Full-bodied. Honey, brown spice and peach flavors. Good, spicy aromas lead to a thick, viscous mouthfeel with high sugar levels giving this an unctuous feel through the finish. Acids are balanced enough to make this very drinkable now, though patience will be rewarded with greater complexity. 91 points." "Medium to full bodied, with honeyed passion fruit, orange and spring flower flavors and aromas, with delicate flavors of green tea that come in towards the end, this well balanced, intense and generous wine is drinking nicely now but should cellar comfortably for until 2020 or more. Score 93." "This too was a hell of a wine. Rich marmalade, caramel and toasted sugar with a nutty contribution. The taste was also very rich, deeply sweet, but still had that characteristic orange zest to keep it from cloying too much. It had layers of caramel with various bits of fruit coming to the fore, but was a heavy, heavy wine..."